Community groups opposed fence on the City’s oldest bridge. On April 5, 2011, Landmarks approved the City’s proposal to build an eight-foot fence and undertake other alterations to the High Bridge footpath spanning the Harlem River between Washington Heights in Manhattan and the Highbridge section of the Bronx. 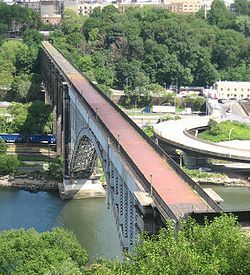 The High Bridge was built in 1848 as part of the Old Croton Aqueduct to bring fresh water into Manhattan. It is the City’s oldest bridge. The City in 1917 ceased using the bridge as an aqueduct. In 1927, the City replaced five of the bridge’s original fifteen masonry arches with a central steel span to allow large ships to pass underneath. The bridge gained notoriety in the late 1950s after children threw rocks at a passing Circle Line tour boat. After the High Bridge was closed to the public in 1970, Landmarks designated the bridge as an individual City landmark. The City in 2009 announced plans to restore and reopen the High Bridge to pedestrian and bicycle traffic. At the hearing, Li/Saltzman Architects’ Meisha Hunter introduced the restoration plan. The bridge’s masonry arches and steel span will be restored, and the original aqueduct pipe and railings will be preserved. Additions to the bridge will include new lighting, fencing, and signage. According to Hunter, the alterations were necessary for safety and security reasons. The plan includes providing handicapped-accessible viewing platforms and new gates to close the bridge securely at night. The bridge’s original cast-iron railing will be slightly raised, and a new eight-foot tall steel mesh fence will be added to meet State Department of Transportation requirements. Li/Saltzman’s Jonathan Favazzo explained that there was a history of people throwing things from the High Bridge and that the mesh fence would prevent vandalism. The plan will also include the installation of 24 new light fixtures in order to comply with state DOT guidelines. Residents and community groups supported reopening the bridge, but objected to aspects of the plan. Manhattan Community Board 12’s Ebenezer Smith opposed the fencing, calling it “insulting” and claiming that it would prevent people from enjoying views of the river. Croton Aqueduct historian Robert Kornfeld objected to the proposed fencing and the lighting, testifying that it would create a “sense of constriction” and a “prison-like” atmosphere. Kornfeld said that it was “hard to imagine that a landmark of this age, quality, and significance would be desecrated like this if it were in the Upper East Side or Central Park.” The Society for the Architecture of the City’s Christabel Gough also opposed the lighting and fencing, and questioned why the bridge needed all the lighting if it were to be closed at night. Chair Robert B. Tierney found the proposal appropriate, noting that he gave “great deference” to the City. Tierney said that the plan returned the bridge to public use and resolved public safety issues. Commissioner Diana Chapin concurred, pointing out the importance of getting people to use the bridge, and suggesting that the fence might not be needed in the future. Commissioner Libby Ryan characterized the fencing as “clumsy,” and also expressed some concerns about lighting. Commissioner Roberta Washington thought the fence was “a terrible solution,” and she was the only Commissioner to oppose the plan. Commissioners Margery Perlmutter and Libby Ryan abstained. LPC: High Bridge, Manhattan (11-7067) (April 5, 2011) (Architects: Li/Saltzman Architects; MKW + Associates).